Things do change over time. Several years ago, when Kurt and I signed up for our first CSA, we both dreaded the mounds of greens that appeared each time we picked up our share. I used to have to rack my brain trying to think of ways to use them all. Then, at some point, I changed my mind about greens. I became a kale advocate, a collards enthusiast, an escarole devotee. Now, when they're out of season during the hottest part of the summer, I actually miss them. To me, a pasta dish doesn't seem complete without some sauteed greens, and even fried eggs look lonely on the plate without something green and leafy accompanying them. Needless to say, I was delighted to receive a review copy of the new book Wild About Greens by Nava Atlas because I now feel the same way. This book covers everything from cleaning and prepping greens to hearty dishes, salads, soups, and juices and smoothies. Even though I've been using greens and enjoying them for a while now, I found several intriguing new ideas to try. Next time I receive mustard greens from our CSA, they'll go into Balsamic-Glazed Chickpeas and Mustard Greens. Other dishes I can't wait to try include the Vietnamese-Style Bean-Thread Noodles with Spinach and Napa Cabbage, simply sauteed greens with Spicy Peanut Sauce, and Italian-Style Braised Chard with Tomatoes. I'm already a convert to putting greens in a berry smoothie, and next I want to try the Spinach Pina Colada Smoothie and the Kale and Pear Smoothie with hemp seeds. First though, I had to make use of some local kale before it's gone for the summer, and the Asian-Flavored Kale and Cabbage Slaw was a great place to start. This is an easy, raw salad that would fit nicely into a picnic menu. I followed the recipe and left things simple, but I kept thinking of all the things that could be added to this. One change I did make was to use savoy cabbage rather than the suggested napa cabbage, and that was only because savoy was available the day I was shopping and napa wasn't. The dressing for the slaw was made first, and that was a mix of olive oil, dark sesame oil, apple cider vinegar, soy sauce, and agave nectar. Next, the kale leaves were cleaned and chopped into thin strips. For a raw kale salad, the leaves need to be squeezed a bit or massaged to soften them. You just oil your hands and work the oil into the chopped kale until the kale turns a bright green. It only takes a minute or two. Then, the rest of the vegetables were added, and those included shredded savoy cabbage, grated carrots, and some sprouts and I used radish sprouts. 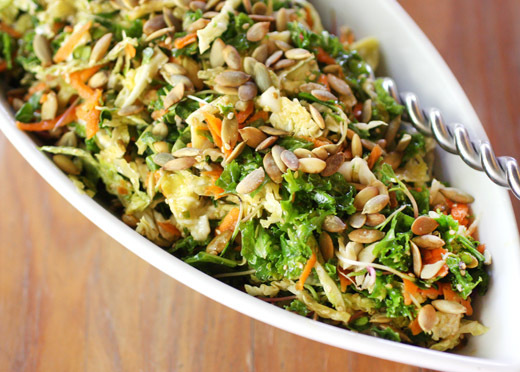 The vegetables were tossed with the dressing, sesame seeds were added and combined into the slaw, and then the slaw was topped with pumpkin seeds. As I spooned the slaw into a serving bowl, I thought about how next time I might add some sliced red bell pepper or some slivers of spicy serrano chiles. Some chopped green onions wouldn't be out of place here, and cubes of tofu on top would make a meal of it. Or, leave it just as it is for a fresh, crunchy slaw with big flavor from the sesame oil and soy sauce in the dressing. It wasn't so long ago that rushing to the farmers' market in hopes of getting some late-season kale would have seemed crazy to me, but I'm glad to be a greens fan now. If I'd had this book back when we started our first CSA, I probably would have become a fan much sooner. Recipe reprinted with permission from Wild About Greens © 2012 by Nava Atlas, Sterling Publishing Co., Inc. Photographs by Susan Voisin. This salad was inspired by Barbara Pollack, a longtime reader of my books. She forewarned me that it’s addictive, and she’s right. Combine the dressing ingredients in a small bowl and whisk together. Strip the kale leaves from the stems. Slice the stems very thinly or discard. Cut the kale leaves into very thin strips and place in a large serving bowl. Oil your hands lightly and massage the kale for 30 to 45 seconds, until the leaves are bright green and soft. Add the remaining salad ingredients, then toss well with the dressing. Let the salad stand for 15 minutes. Taste and adjust the tang, saltiness, and sweetness with more vinegar, soy sauce, or sweetener to your liking, then serve. Super healthy and wonderful tasting! A great slaw. I just cooked kale and cabbage today but not in the same dish like this! This looks very healthy and tasty. Lisa, this salad looks great, like the combination of kale and napa cabbage...I have to give this a try...very simple and yet so tasty. I wish we had a CSA here! I wish I stick with my CSA a bit longer. Receiving cabbage and collard greens only for five weeks in a row made me quit. Maybe next year, I can pick a different one. Your salad looks beautiful. Perfect for hot summer nights. Such a healthy and vibrant slaw.. Beautiful!! I need to make this soon. This is a great story of how a CSA can change your life. Wild about Greens sounds like a good book for deploying the whole gamut of leafy vegetables. I'm pinning this one. What a great way to use kale! Asian slaws are so flavorful and refreshing; a great summer side dish. 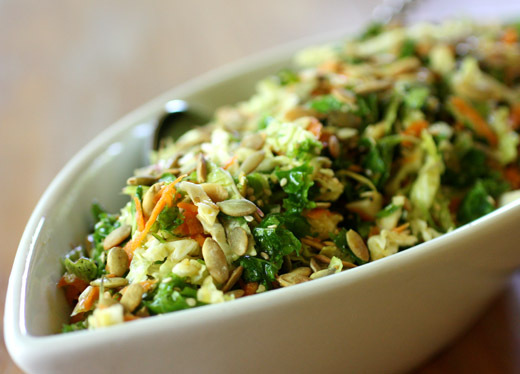 A very tasty and healthy slaw recipe! I made this salad for dinner last night and received rave reviews! 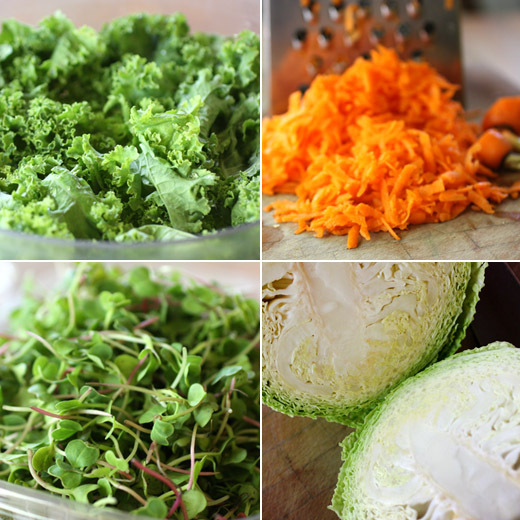 We prefer kale cooked or mixed with other greens when eaten raw. I will most certainly make this salad again as it was a terrific combination of textures and flavors. This salad would be perfect to take on a summer outing or other event if the dressing was added just prior to serving. My only suggestion is to add thinly sliced green onions. An exceptional salad! Greens and I had a rough start as well but now we're in the midst of a torrid love affair. Basically, they're my favorite. I definitely can't wait to try this! This is a beautiful salad and an Asian dressing is the one thing that goes down well even for my vegetable-hating son. Everyone will love this and really what better reason to plan a picnic now. I definitely need to cook and eat more greens!! And this recipe is now bookmarked. I love it! Barbara: Sounds like this recipe has a great history! So interesting to hear how it's been passed along. I'll have to add pignoli next time. Your slaw looks delicious, and I definitely want to check out that cookbook! How much do I love greens? Maybe almost as much as you, Lisa. :) Also a relatively recent convert, I feel similar that meals, from breakfast through dinner (and sometimes dessert) just aren't complete without something leafy or herbaceous. This slaw looks stunning by the way. So many things I love in one dish - huzzah. Oh, wow, I just love the sound of this salad! Full of fabulous ingredients...and love the Asian dressing. MMMMmmmmmmm.